The following on page SEO tips for BlogSpot (Blogger) blogs will help your blog to be indexed, listed and highly ranked in Google’s search engine results pages (SERPs). BlogSpot offers an excellent platform for bloggers. It is free, and enables anybody with a desire to start up their own blog to do so without having to pay for it. Blogger is a straightforward blogging platform. It is Google’s free blogging service, and like any blog, must be hosted. BlogSpot is the hosting service provided by Google for Blogger, although the two are often used synonymously. Let’s say you have a WordPress blog hosted on Bluehost – Blogger equates to WordPress and Bluehost equates to BlogSpot. It’s simple, although, while you can use WordPress on any hosting services, Blogger must be hosted on BlogSpot. The two come together as a package. 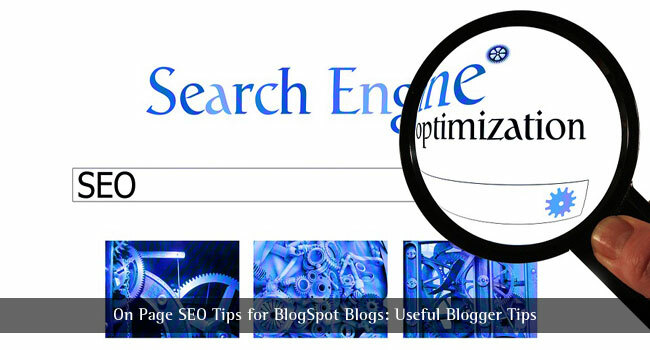 One of the unfavorable aspects of Blogger blogs is that it is very poorly optimized for search engines. Keywords, title tags and Meta descriptions are not properly optimized, and this can cost you dearly in the competition for ranking position. There is also a misconception among many that, because BlogSpot (Blogger) is owned by Google, then their blog will be listed on that search engine in preference to other platforms such as WordPress. That is not the case! Google’s indexing and ranking algorithms might give some precedence to BlogSpot blogs, everything else being equal, but you are not guaranteed any form of advantage otherwise by using it. You must apply sensible search engine optimization to your blog, whether it is a BlogSpot or WordPress blog, and these on page SEO tips for BlogSpot blogs will help you to achieve a higher ranking in Google SERPs. So to begin, what is ‘on page SEO?’ Although there are many different search engines, we shall discuss Google from now on. Google takes the majority of search engine traffic, and many of the other search engines use Google results. Another generalization we shall frequently use is ‘Page’ to include any blog page or post – and even a website page if you also run a website. As far as Google is concerned, web pages, blog pages and posts with discrete URLs are all the same thing – pages as opposed to domains (entire websites). We will also use the term ‘keyword’ to include a single word or a phrase. So, ‘SEO’ is a keyword as are ‘SEO Tips for BlogSpot blogs’ and ‘Blogger tips’. On page SEO is the optimization of your web page that is visible to search engines. The web page can be a regular website page or a blog page or post. By ‘visible’ we mean visible to Google algorithms, which can ‘see’ more of your web page than what is visible to you on the page. This includes the content of the ‘head’ section of your page HTML, text and image formatting and other factors we shall discuss below. A linking strategy is not on page SEO, and neither is any form of off page marketing, such as Adsense, paid ads, article marketing, directory submission or social networking, such as links to Facebook, Twitter or any social bookmarking site. They may be regarded loosely as ‘on site’ SEO or marketing, but not ‘on page’. The term ‘Keywords’ refers not to the vocabulary on your page, but to the search terms employed by people using search engines to find information. Your BlogSpot or Blogger blog is regarded by Google as a source of information – and it will direct a customer to you if it believes you can provide that information in an authoritative way. One way to persuade Google that somebody seeking information on how to use SEO for their blog is to write a web page or blog post on that topic in an authoritative way. Google might believe that this page titled “On Page SEO Tips for BlogSpot Blogs” offers good solid information that might help its user, but you must provide some persuasive proof that it does! Before it presents this page as a possibility Google will take over 200 factors into account. Many of these factors are involved in what is known as on page SEO. Google looks at the Title tag to find the general focus of the page, then at the Meta Description tag for more information. It then looks at the page content to establish how much of an authority this page is. To underpin that, it then searches for other websites linking to that page which shows Google how many others believe it offers good information on that keyword. However, these off page SEO factors are not what we are considering here. It is purely the content and settings on your blog page over which you have a direct influence on that for now. The others – the off page linking structure, Google authority rank and other ways you can use to make your blog look authoritative in Google’s eyes will come later – or may be built into the blog’s template. So how do you use keywords to attract visitors and persuade search engines that you can offer just what their customers are looking for? Don’t believe everything you are told or read, because this appears to be a very controversial topic. Yes, they do! Ignore anybody that tells you they don’t, because even Google still use them as a large part of their indexing algorithm. It’s nonsensical to claim that Google now looks only at vocabulary, and you can be ranked for a keyword that does not appear on your page. LSI (latent semantic indexing) is a concept that Google claims it uses to establish the meaning of your web content. It can do so by means of semantics and synonyms, or from the meaning of words rather than the words themselves. This is untrue – Google still reacts positively to keywords, but it will also take the vocabulary of your blog page into account in trying to establish its meaning. You will have specific keywords and phrases that describe what your page is about, and also another vocabulary that expresses the same things but using different terms. For example, if you want to get traffic for the keyword ‘How to Write a Blog Post‘ then you should use that as the title of the post. However, there are alternative ways of saying this, and you should use these in the post. Google will reward you more than if you simply repeated that phrase over and over again. Use your principal keyword or phrase as near to the beginning of your page as possible without making it appear contrived. Use it at least once in an H2 Heading with bold text, and once more in the final paragraph. In an average 500 word post, you would use it no more than 2-3 times more in the article. So your keyword density (KD) would be 1.0% – 1.2%. That’s fine, though you go up to 2%-3% for short 1-2 word keywords. You could start with “Knowing how to write a blog post correctly …” and so on. Then, rather than just repeat the keyword, use associated terms such as “Writing blog posts properly is an acquired skill …” and “If you understand how to create posts for your blog …”, and so on. So you are varying the language used to present your content. This is what Google refers to as ‘latent semantic indexing’ or LSI. What the term means in the way that Google’s indexing algorithms use it is that you will benefit from using a wide vocabulary in your content rather than repeating keywords. It is better to write naturally about a topic, when your knowledge will be displayed. Google takes the vocabulary of your Title tag and opening paragraph, particularly the first few words of each, as being important to the content of the page. These should contain your target keyword/phrase that sets the scene, so to say. That should then be underpinned by the use of synonyms and related phrases, such as in the example above. The algorithm can analyze your vocabulary and its semantics (the meaning of the words used) in the body of the article, and then assess the authority of that content with respect to the target keyword: that is the search term used by the person using the search engine for information. Google looks at what you write and where you write it. If you are stuck for words that express your target phrase in a different way, go to thesaurus.com – this site will give lots of alternatives. For ‘write’, for example, you could use compose, pen, create, draft, author, ‘dash off’ and so on. That is better than using the same word multiple times – Google will punish keyword stuffing. The type of coding used (e.g. HTML). The language used (English, German, etc). Optional fonts that can be used. A description of the page content. A list of keywords relevant to the page and much more. We won’t discuss all of these here – only those that relate directly to the page-related SEO over which you have full control. These are the Title tag and Description. Only two, but these two can make a massive difference to your Google ranking. Title Tag: This should be the same as the title of your page, but doesn’t have to be. However, if the two are different, your ranking points from Google will probably be diluted. You should use the principal keyword for your blog page in your title. Try to make it the first word in your title, or if that is not possible, at least put is as close to the beginning of your title as possible. When you start a new post, you will see the Title box at the top: If Google indexes and lists your post in its search engine results page, this text will be shown in the title. At one time, the title tag was permitted a maximum of 59 characters long before being truncated in the listing. Google has recently changed that to a pixel count. 512 pixels seem to be the maximum. If you go above that, it will be truncated back to about 500 – the 12 being used for the ellipsis, used when the description is cut short. There are tools online that enable you to check the pixel count of your title. You should include your main page keyword at the beginning of the title, and if space allows, add a secondary keyword after that. We have use ‘Useful Blogger Tips’ as a secondary keyword. This helps your SEO, particularly since Google will know to associate ‘Blogger’ with ‘BlogSpot’. We shall discuss how Google displays your title in its search engine results listing later. The description beneath the URL for the site is exactly the same as that entered into the description box explained below). If you don’t include a description tag, then Google will usually take the first few words of the page content. Although there is evidence that Google may also be applying a pixel count to this snippet, it appears to be locked at 156 characters for now. Click to enable search description. Then enter a description for your blog. Use your main keyword towards the start of your Description Meta tag and then describe what the blog is about. BlogSpot allows you to use a maximum of 150 characters. Use your principal keyword at the beginning of the description. Note how this is the same as is published in Google’s listing for this blog. This will only appear after you click the ‘Enable search description’ check box as above. Enter the description for the post in the window. Use your main post keyword in the first few words of the description. Try to throw in a secondary keyword, such as: “On page SEO Tips for BlogSpot blogs to help you achieve higher Google rankings. 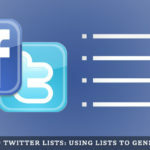 Use these useful Blogger tips to get more traffic to your blog.” That is 143 characters long. As with the site description, you are allowed 150 with Blogger though Google generally allows 156. If you look closely at the above example, several keywords have been used without overdoing it. Each keyword is a potential term used by Google users who may be looking for exactly what BloggingTips.Guru offers. 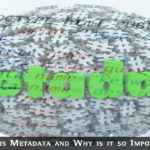 Keyword Tag: If you check the source code of your website or any other website online, you will also see a ‘Meta keyword’ tag. This is largely redundant now, although some obscure search engine might use it. Throw in your top one or two keywords here if you want, just to be safe, although Google pays no attention to it. 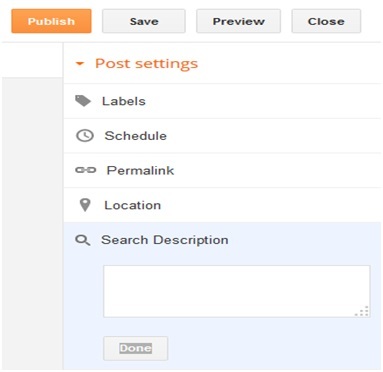 You can add tags or ‘Labels’ to individual posts rather than use a keyword Meta tag. These are keywords related directly to the post. Click on ‘Labels’ to the left of your editing window, then add 4-5 keywords or phrases that people can use to find your post. These are the Meta tags that you can control. Yes, you can also edit any of the others, but unless you are a whizz-kid, you should leave everything else alone. There are other on page tags you can change, but keep it to the Title and Description tag for now. Not very SEO friendly! It is important that you do this when you first create the post: Look to the right for the Permalink link. Click, and you will find a checkbox for ‘Custom Permalink’. Check that then enter your keyword rich link. Simply enter the keyword part, such as the title of this post. Changing Your Google Listing Title: Post Title First, Blog Title Second: The title of your BlogSpot blog post is more important to your readers than your blog title. The title that appears in the search engines results page is the Title tag in the head section of your HTML. With BlogSpot, this will generally be the title you entered when you wrote your post. The trouble with BlogSpot blogs is that Blogger shows the Site Title or Blog Name first then follows it up with the post title. For example, if your blog title was ‘My Fabulous Blog’ and you wrote a post titled “How to Make Money From Your Blog, this would appear in Google’s listings as ‘My Fabulous Blog – How to Make Money From Your Blog’. This might not suit you, particularly if you want the main post keyword to appear first. Potential visitors to your blog will be looking for listings related to the search term they used in the Google search box. Google will have listed you on the strength of your blog post, but if Google users see your blog name first they will likely ignore it and carry on down the listing. It is better for your post title to appear first. 1. Once you are logged into your BlogSpot account, backup your Blogger template. To do that, click on ‘Template’ on your Dashboard. Now click on ‘Edit HTML’. The next time your blog is crawled by a search engine, your post Title tag will appear in front of the blog Title tag (How to Make Money From Your Blog – My Fabulous Blog). This should improve traffic to your blog post. You should take a close look at your title in relation to the overall focus of the page. Use the main keyword at the start, then try to fit in some other relevant text or keywords after that without making it appear contrived. It is possible for the same BlogSpot blog page to rank more than once for multiple keywords. We shall now discuss some useful Blogger tips relating to keywords and their use. We have already discussed keywords and phrases in general terms, but now let’s look at some specifics. Using Title and Paragraph Headings: This leads us to the first major tip related to on page SEO: include your keywords in headings or headers (same things). BlogSpot blogs use H1 title headers as default – unless you use an image as your header (such as a company logo), in which case H1 disappears altogether. Trouble is, the blog name is in H1, but post titles are in H3. You should change this. H3 for sub-headers and so on. If you make every header H1, Google will likely ignore them all. You may read many views on this but the one most acceptable to Google and for SEO is as above. That’s what Google intended with the H format and what you should do. This leads to a problem with BlogSpot blogs. 3) Save the template. Now your Post titles should be enclosed in H1 tags. Use these as stated. If you ever want to change the font size of a header simply do so using the font editing facility. If you know HTML, then click on HTML and after the H tag add <font size=x) with x as your preferred font size – don’t forget to finish with </font>. However, the Blogger defaults are good sizes for their respective hierarchy of header and you would usually have no need to change them. Header SEO and Keywords: Make sure that each header means something. It should relate directly to the content following, and also contain keywords. Do not overuse your primary keywords – you can use them in one or two headers but otherwise use synonyms for the keyword, related terms or your secondary keyword if you have one. Our secondary keyword is ‘Blogger tips” in this post. Matt Cutts, Google’s web spam guru, states that you can have H1 headers multiple times where relevant, but not to use them throughout the page. So H1 at the top, then H2and H3 for all the subtitles if you want to use them. ‘Image address’ is the web address of the image, but the component relevant to use here is alt=”how to write a blog post image 1″. If the image fails to resolve for any reason, the alterative text will be displayed on the screen. This explains to the reader what should be in that area. Use your target keyword or a derivative of it in the html coding for each image. b) Upload the image and then select it. Enter the image title and then the Alt text you wish to use. Make this your main keyword. If you have several images on your page or post, then you can also use alternative or minor keywords. Re the title: don’t include spaces in image titles – use hyphens or underscores between words. This is not so much a ‘how to’ but a ‘how not to’! There was a time when Google rewarded you when you used keyword anchor text in your on page links. Not now! Not after the Penguin algorithm updates! Google might now regard keyword-rich anchor text to be keyword spam and flag your site. Avoid passages such “there are many useful SEO tips available if you look for them. By using these SEO tips on your own blog, you can easily get high Google rankings. This will almost certainly get your page flagged and perhaps your entire domain deindexed. Use your own product brand name that is associated with your website. Employ long-tail keywords in your link such as check out these on-page SEO tips for BlogSpot blogs. This applies to all links you publish on your blog. You might sell some products, or provide links to other blogs or websites in your navigation bars. If you use anchor text it will pay you to use the brand, website name or the URL of the target page rather than try to use a keyword to influence your Google ranking. Google looks upon such practices as being ‘link spamming’. The SEO advantage a blog has over a static website is the fresh content that comes with every post. Another benefit is the comments. Content-rich comments can do wonders for your blog SEO, but they can also destroy it. It doesn’t take many unmoderated spammy comments to lose a blog post its ranking! It is extremely important that you keep an eye on the comments. Some bloggers do not allow comments, but that is very negative. They can do a lot of good for a blog, and apart from the SEO, they keep your readers involved. They feel part of a community, and you also give them an opportunity to blow off steam with an occasional rant. Moderate your comments, and publish only those that adds to the post – perhaps fresh information, another viewpoint or a question. Respond to them, and become involved with your readers – but never allow spam to be published, or even a host of unmoderated comments to wait in the list for approval. Submitting your blog to Google Webmaster Tools is likely the most important SEO action you could take with any website or blog – but it has nothing to do with on page SEO. Follow the above useful Blogger tips and you will have done your best to get the highest possible ranking for your BlogSpot blog. SEO is not about tricks or illusion. It is not about fooling Google or any other search engine. These on page SEO tips for BlogSpot blogs are about helping you achieve the highest ranking you can on Google by following Google’s guidelines. Hey, thanks for such tips it’s very useful for any blogger. I’m looking for this kind of information and you described it very well. Hey, thanks for providing this SEO On page tips for blogs. They are very useful and very important for any blogger or SEO executive. Great article SEO On Page tips for bloggers it is very helping for bloggers who are facing the trouble on SEO blog.